Every ambitious Internet company wants some of the billions consumers and advertisers spend on TV. It’s an article of faith among the digerati that dollars will follow eyeballs, which means big money for everyone from Facebook to Google to Apple. But that hasn’t happened yet. 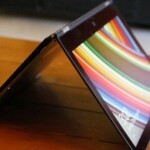 And it’s possible that even as Web video grows, TV will continue to do just fine. That’s the thesis of Bernstein analyst Todd Juenger, who made his case to investors earlier this week. Two slides from his presentation sum it up well. 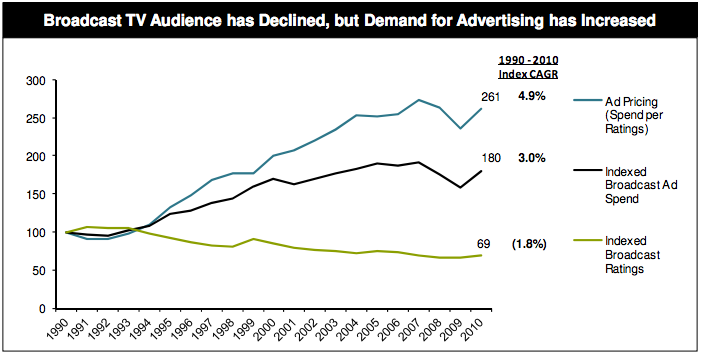 Even more important: Though the Web ad business is growing, TV continues to grow, too. 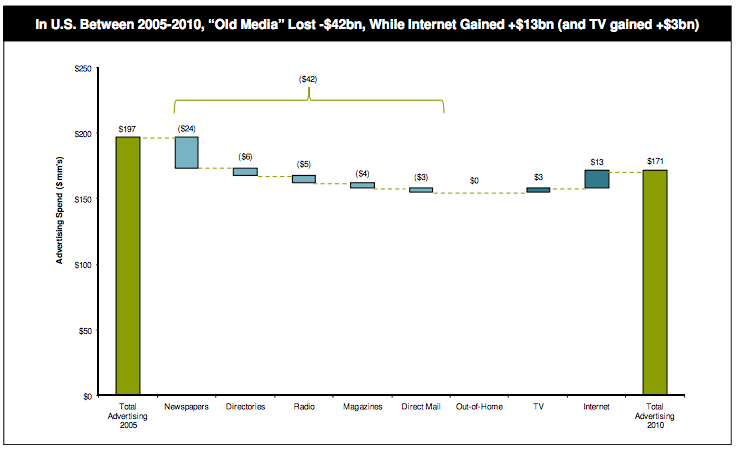 And while other old media industries have shrunk, their losses haven’t turned into equivalent gains for the Web (click to enlarge). But what about consumer spending? After all, Netflix is streaming more than 2 billion of hours of video every three months. That has to cut into TV, right? Not really, says Juenger, noting that overall TV viewing is still up. Instead, he says, Netflix, iTunes, Amazon et al are eviscerating the DVD business. Important distinction. And yes, all of this could eventually change, particularly if the digital guys figure out how to break up big cable’s lock on programming. But as we keep pointing out, that’s a very strong lock. It’s not going away anytime soon.